We want to Shout Out to amazing Love Agents! 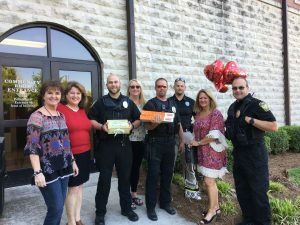 Thank you for sharing love notes and Love Boxes to countless people and families. 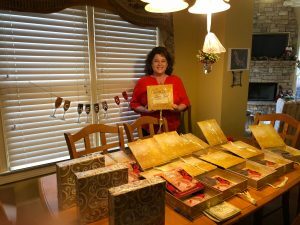 In the past year the following people and groups have benefited from special deliveries – love notes, Love Box books and Original Love Boxes. Makes everyone smile – the givers and the receivers. This entry was posted in Miscellaneous on April 8, 2019 by Christine Martinello. One thing is for sure – families and the world need more love. Don’t you think? So, we’re planning to shower lots of love upon women and children recovering from mental health issues and homelessness. 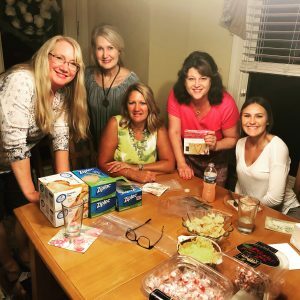 We want to provide love notes and love boxes for at least 35 + women and could use your support. 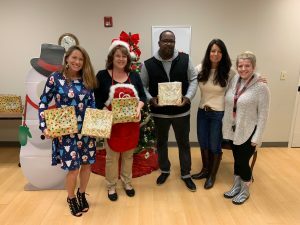 We’re partnering with Home of Hope Gwinnett Children’s Shelter and Avita Community Partners. 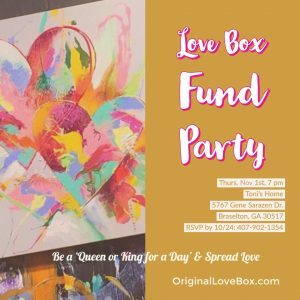 Host a ‘Love Box Fund Party’ with your friends or with a non-profit group you love. Please pray and see how your heart is opened. 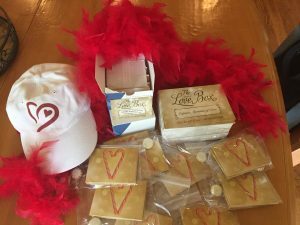 We’re believing for 35 women to get love Boxes @ $35 each. So, that’s $1,050. Would it bless you to give? All our love & gratitude! This entry was posted in Miscellaneous on October 23, 2018 by Christine Martinello. 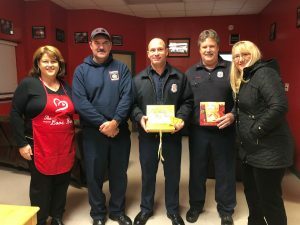 This entry was posted in Love Box Impact and tagged community, Firefighters, Love Agents, Original Love Box, Sept 11 on September 12, 2018 by Christine Martinello. How is your life different since 9/11 2001? I remember that fateful day starting out sunny and cool in Dayton Ohio. In the morning I watched TV in disbelief and fear as the twin towers toppled over. Much was lost that day and it was the beginning of a newfound appreciation for life and loving our neighbor. We each had a choice to make. Would we be consumed by fear or focus on faith and love? Days after 911 Bob and I decided; we won’t let fear rule our family, have a place at our table or in our hearts. We would go order selves and our neighbors so that the world would become better. We seriously thought about the kind of world we wanted our children to be raised in. We decided to let faith in God and his love lead us. We put our trust in each other and stepped up efforts to promote a loving family and a more loving community. We committed our time, energy and money into creating a better world. The sacrifices of all those who suffered were not in vain. Our country has become more vigilant in protecting us. People have stepped up to do good & unleashed a fierceness of love. Let us each pick up the torch of freedom and create communities that we are all free to live in. Let us not forget where we were and how the world has changed. We can continue to change America with each of our actions or inactions. Let’s encourage one another along this journey. Encouragement is like a cold glass of lemonade on a sweltering hot day. 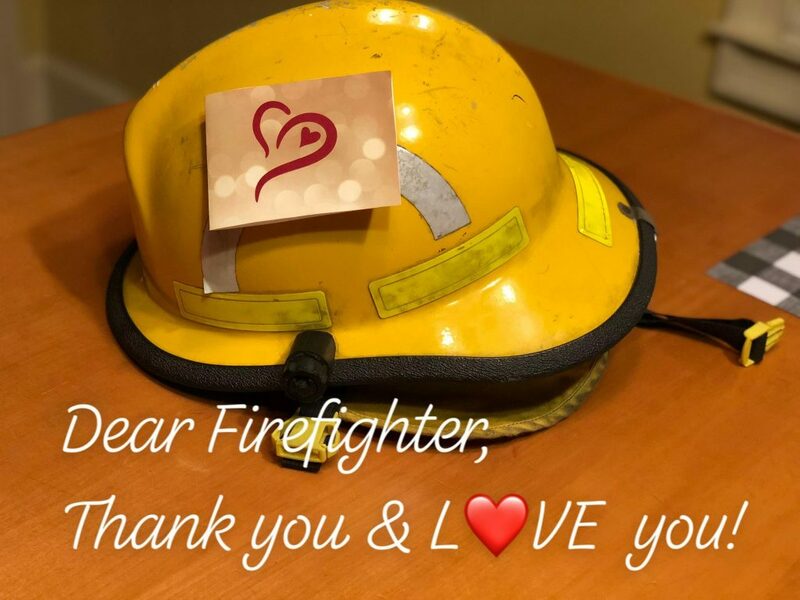 Tonight at 6:30 PM we will write love notes to fire fighters from Georgia to Carlsbad California. Please take a moment and encourage first responders. 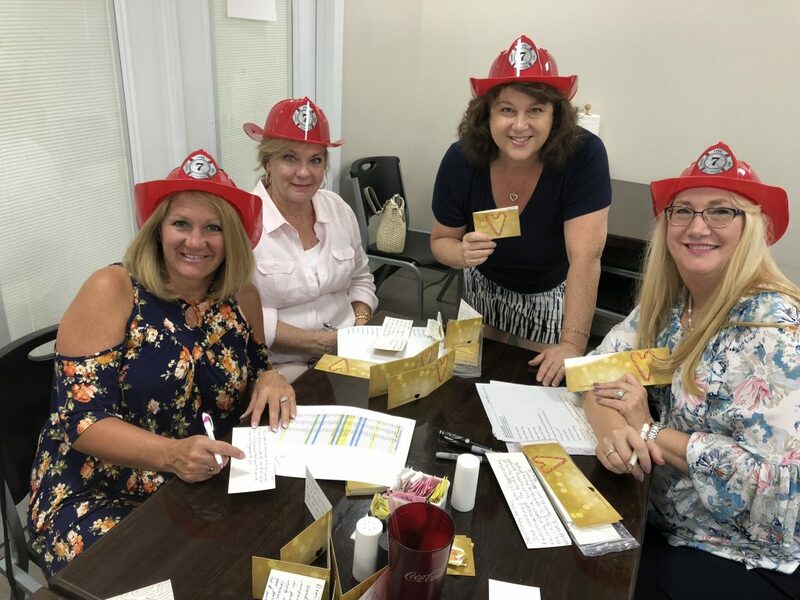 This entry was posted in Express Love and tagged community, family, firefighter, love, love box, originallovebox, Sept 11 on September 11, 2018 by Christine Martinello. This entry was posted in Miscellaneous and tagged couple, experience, gift, love, Original Love Box events, valentines day on February 9, 2018 by Christine Martinello. 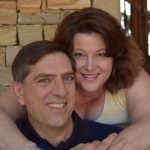 Recently, my husband and I celebrated our 25th anniversary with not one, not two, but 10 special events. That’s right. What started out as a two week vacation turned into months of celebrating everywhere we went. Including: renewing our vows and partying with dear friends, going out for multiple anniversary dinners and being showered with many free desserts and unlimited well wishes. Why did we go overboard? Because being married for 25 years is a huge accomplishment and our love deserves celebrating! We’ve learned a few things about relationships along the way. Every relationship goes through seasons and once in a while, it needs a spark to re-ignite it. If you’ve been in a relationship for a while, you may need to jump start things. Here is a recipe to add a SPARK of love to your relationship. Your love story is a grand adventure and God is in it with you. God is the glue and the ultimate power source to your love. Pray together and watch God bind you closer together than ever. Remember – a strand of 3 cords can’t be easily broken. To Do: Ask your partner: “What is 1 thing I can do this week to be a better partner?” Then listen. Sit quietly and really hear what the other person said, without getting defensive. Then, as long as it’s not offensive to you, when you’re ready to step out of your comfort zone, try it. Hug, kiss, hold hands and be intimate. All of these physical touches are critical to keeping you close to each other. Research shows that hugging (and also laughter) is extremely effective at healing sickness, disease, loneliness, depression, anxiety and stress. Research shows a proper heart to heart hug builds trust and a sense of safety. To Do: Ask: How many hugs and touches would you like each day? Spend time together & apart doing NEW things. Add novelty to your relationship. Engage in New experiences. Try new things together. Whether it’s traveling to a new country, taking a cooking class, or writing YOUR love story, this too will help keep your relationship alive. Engaging in new experiences will allow both you and your partner to learn new things about yourselves and each other. It also provides room for excitement, and to support each other. Do the Original Love Box tradition. Write each other love notes and read them aloud to each other. Try writing your love story in the Original Love Box book. Keep your love alive by reliving wonderful past experiences and creating new ones. You can keep your love story alive for future generations as well by writing it in the Original Love Box book. It’s such a treasured keepsake. It’s vital for us to express ourselves. The good and the bad. Make sure you pour loving words into your partner and your kids. What’s a good ‘Love Talk ratio’? Say 5 ‘Love Talks’ to 1 correction. Pump 5 positive, uplifting and loving statements to 1 negative one. Your tone of voice speaks volumes. Start the Original Love Box tradition and keep pumping love notes into your partners life. Write love notes to each other! If you hurt the other, be sure to extend grace and forgiveness. Do the 3-H Forgiveness method. Kathrine Lee, creator of the Ultimate Source recommends forgiving with your head, heart and hands. Forgive logically by thinking about making the conscious choice to forgive. Then search your heart and spiritually forgive them. Then extend your hand to forgive them and ultimately, use your hands to help another person. K – Keep On Keeping On! Different ages and stages bring different changes. Each season has challenges and opportunities for growth. Keep working on your relationship. Remember; the only way you can lose is if you give up. Relationships have ups and downs. Keep the faith and keep believing in the other person. Stay hopeful and add a spark to have a happier and more rewarding relationship. Wish you a love to last a lifetime. You can add a fresh spark to your love at any time and enjoy a long and loving relationship. What’s 1 thing I can do to be a better partner this week? What can I do that’s novel and different? This entry was posted in Express Love, Miscellaneous and tagged box, couple, date night, engaged, family, love, love note, marriage, Original Love Box, physical, relationship, spirituality, Valentines day gift on February 9, 2018 by Christine Martinello. What’s the 1st word that pops into your head about the holiday season? It was time to change and to enlist help. My hubby and I looked around and realized we had a whole team of helpers at our disposal, they were just disguised as family members. So, we decided to organize and mobilize ourself and the troops. 1. Have a Plan. Make a plan for your time, your health and your Spiritual growth. Use the Holiday Help! checklist and stay organized. 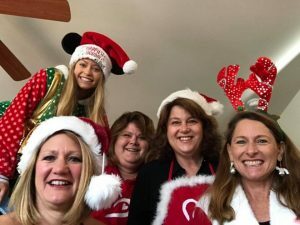 The Holiday Help! checklist includes all the activities that make the holidays complete and you can tweak it for your family. You post it on the fridge and let each family member or holiday guest “sign up” to help. Then, assign a completion date for every activity on your calendar and who is responsible for its’ completion. The checklist keeps you organized and holds everyone accountable. If no one signs up for an activity, it doesn’t get done. Oh what fun, it is to get the whole family helping along, Hey! When you’re organized and everyone’s working together cheerfully, everything is better. 2. Be still. Pray, meditate and open your heart to the Spirit. Focus on the true reason for the season. Read the Bible, devotional or other spiritual books to slow you down and grow in faith. 3. Simplify the Season. Ask; Why are we doing what you’re doing? Ask your family, “What are the most meaningful traditions? Do those & ditch the rest. 4. Control gift giving. Ask the kids TODAY: “What gifts do you remember from last year?” Then brace yourself. If your loved ones can’t remember, simplify to just 3 gifts. After all, 3 gifts were good enough for Jesus. 5. Focus on Relationships. Focus on growing in love instead of more stuff. Simplify and include others in the Season. Let go of wanting things to be perfect. Life is not a Hallmark show. They’re not going to be. Strive for ‘good enough’ instead. You really do NOT have to do it all alone. When we let others help we teach our kids and hubby how to love by serving. 6. Be grateful and Focus on the Moments – See all the joy in faces of the people you love and the moments. 7. Give the gift of Love. Grow closer together with family and friends as you share your love with the The Christmas Love Box tradition. 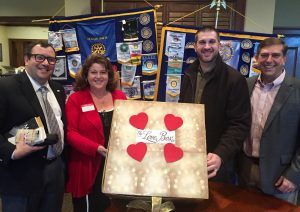 If you’re not Christian, you can do the Original Love Box tradition. Giving the gift of love is the greatest gift you can give your family and the world. Wishing you and your heart joyful moments amidst controlled chaos. Keep the faith and by all means, just keep breathing – deeply. Breathe in: I am at peace. Breathe out: I share love. This entry was posted in Holiday Ideas and tagged christmas, Christmas Love Box, family, happy holiday, healing, health, Original Love Box, peace on December 6, 2017 by Christine Martinello. Tell them what’s going on at home. You support & respect them. This entry was posted in Holiday Ideas and tagged Christmas gift, Christmas Love Box, family love, Love notes, Military, Military fami, Original Love Box on November 9, 2017 by Christine Martinello. Our soldiers work hard to defend our freedoms and their families sacrifice much. We decided it was high time to send them more love! 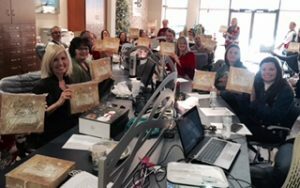 The Love Box Mission: To be ‘Love Agents’ for the Military Family by providing Original Love Notes® and/or The Original Love Boxes®. Let’s give every soldier as many love notes as possible and give their families a Love Box too. The Love Box for Military Families includes the Original Love Box® plus unique patriotic items especially designed for military families. 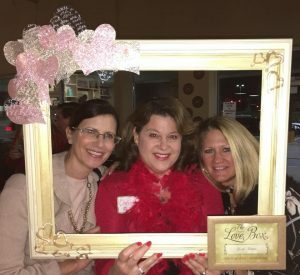 Benefits: The Original Love Box® for Military Families is a powerful tool that will benefit soldiers and their families every day and keep them close, especially during periods of deployment when military marriages are the most stressed. Organize a Love Note Campaign to send military soldiers and their families more love now. Suggested donation: $1 per love note. Sponsor an Original Love Box® for one or more Military Families – $39.99 each. Provide extra Original Love Note Packs – 20 love notes – $9.95. 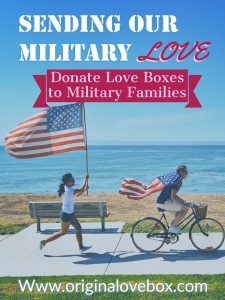 Donate seed money toward the creation of ‘The Military Love Box’. ______________________ Your idea here! Would love to hear it. 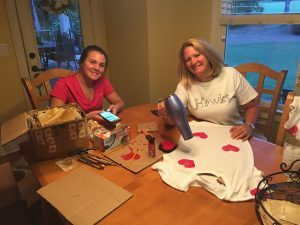 Who’s Involved: Christine Martinello, Inventor of the Original Love Box® & Jacqueline Arnold, Creator of Sweet Life USA (www.sweetlifeusa.com) are joining forces to send our military families more love. 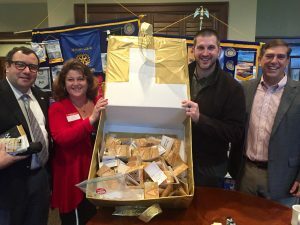 The Braselton Rotary is hosting these keynote speakers at the Nov. 9th meeting @7:30 a.m.
Let us know if you want to join forces and send love to Military families. Because of you, we can spread more love! You help educate & encourage military families so they can build foundations of love. Thanks! This entry was posted in Miscellaneous and tagged Christmas gift, family, Love notes, Military, Military family, notes for military, Original Love Box, send our military love, support our troops on August 24, 2017 by Christine Martinello. Hope you’re getting ready for a very happy Fourth of July. We sure are! 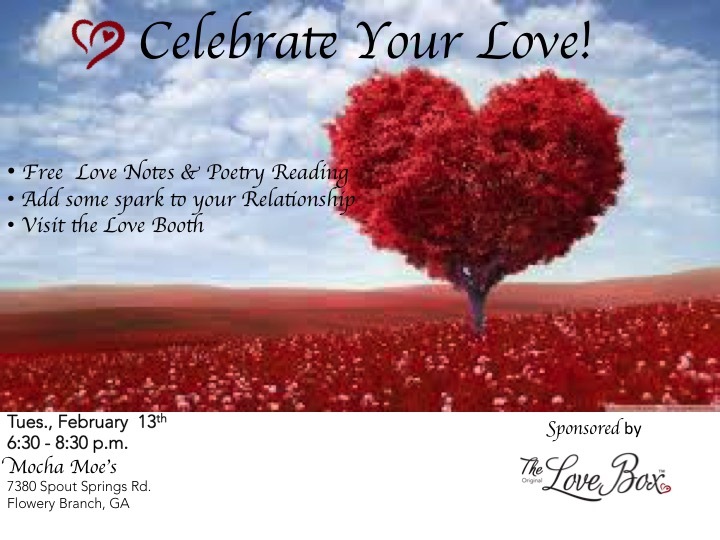 The love agents (Cindy is above) and I will be in the parade in Braselton, GA starting at 6 PM. We’ve had such a blast getting ready for it. Rather than throwing candy we’ve decided to pass out 600 love notes so people can write & read them to their family. Yes, there will be a little candy in there to weight them down. ? 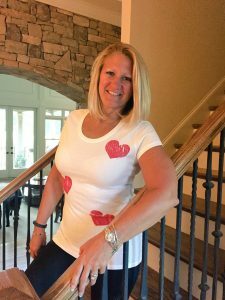 The lady love agents and I are going to wear the heart T-shirts (above) and a red boa. How fun is that?! My husband and sons are coming too and we’ll see how much they get into it. I can’t guarantee my College agedboys will wear hearts. It really is awesome to give through our business and bless so many families. 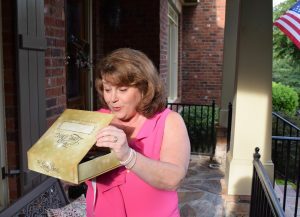 The Original Love Box , books and love notes have brought families together across the world. We are thrilled to bring freedom to relationships and to help people to express their deep feelings. It is our honor to help people give the gift of love, one note at a time. On this Fourth of July we hope you’ll express your love and gratitude for each person that is in your life. We have such limited time together and today is the day to express what’s in your heart. Don’t hold back. Be free to express your loving feelings. God bless you, your family, and America! Hope you have a happy and fun 4th! This entry was posted in Miscellaneous on June 30, 2017 by Christine Martinello.